I am a clumsy person. It comes naturally. So clumsy in fact that when I was pregnant with my youngest, I feared that my husband would have a nervous breakdown. I comforted his nerves by constantly holding my hand, or stand facing me with his arms held out around me to catch me just in case I would trip on air and fall. You could imagine his panic every time I got close to a set of stairs. So due to my clumsiness, an athlete I could never be. I married an athlete. You know, one of those that can move their feet, arms and hands at the same time without breaking something. When I met my husband, he was involved in numbers sports. Some included winter "fun" sports like bowling and wanted me to join him, coordination or not. A couples night of sorts. Well as you can imagine, since I have to move my feet to bowl correctly I wasn't exactly what you would call good. Just about 3 years ago, we decided to give darts a try. The hubs already had a set of darts and played regularly. I figured since my feet can remain stationary, I might be ok. (I have to mention that I have sprained my ankle throwing darts. Don't ask.) 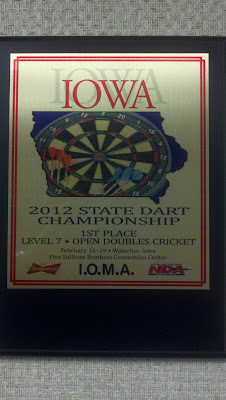 Little did I know that 3 short years later, I would have the title of Iowa State Dart Champion! 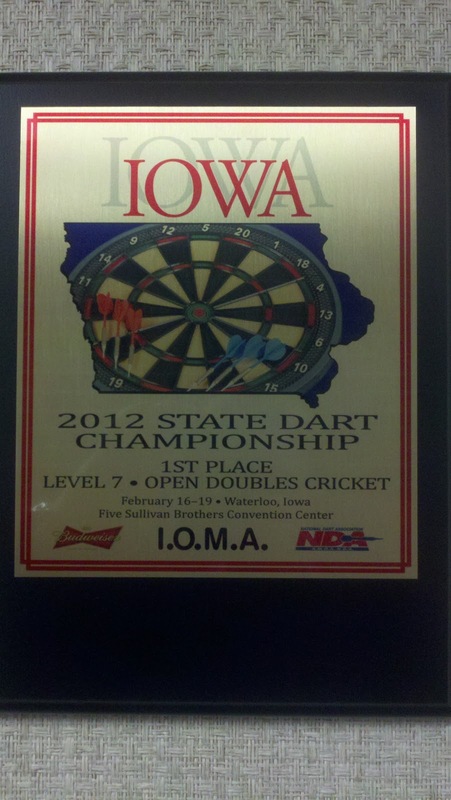 My cousin and I have competed in the State Dart Tournament every year since I have started throwing. Our game is doubles Cricket. This year, we went in without expectations. Our main goal is to have a good time. When we started throwing, we were focused and evened each other out. If one was doing bad, the other would be doing good. After 7 hours of throwing on Friday night, we had won the winners bracket. That means that we were the top of the hill, no one was above us. We were told by the officials to return the following day to throw against the winners of the losers bracket. In the tournament, we play double elimination. When you win the winners bracket, the losers must beat the winner twice. The winners on the other hand only have to beat the losers once. So we knew going in that we may have a battle ahead of us...a battle that was in our favor. We won the tournament in only two rounds (out of potentially 9). My cousin went up and threw a 7 mark which closed out two numbers. That was huge. This left me with the bullseyes to close. I went up, threw one bull, then threw my second dart only to have it land dead center, right in the double bullseye area. I will never forget the look on my cousins face when I turned around. What had just happened didn't register with her. The somewhat blank look transitioning to a huge smile and laughter followed by a huge hug is a moment that I will never forget. We won. We got a plaque and had our picture taken. And what do you know, my dad now calls me an athlete.